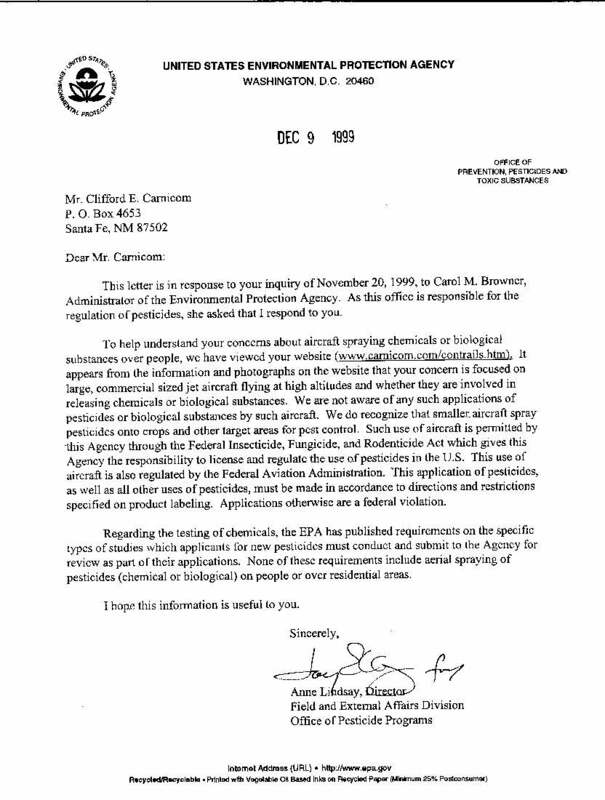 Postscript note by Clifford E Carnicom: One would logically conclude that the EPA, having viewed the evidence submitted on www.carnicom.com, IS now quite aware of "such applications" by "such aircraft." 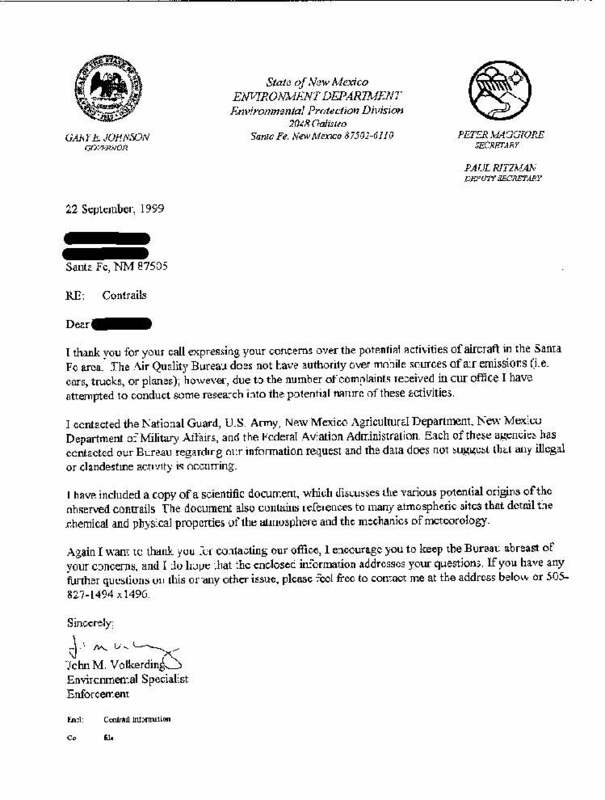 Pictures captured and posted in this paper show massive aerosol trails sprayed in criss-cross patterns in Santa Fe, New Mexico on November 3, 1999. 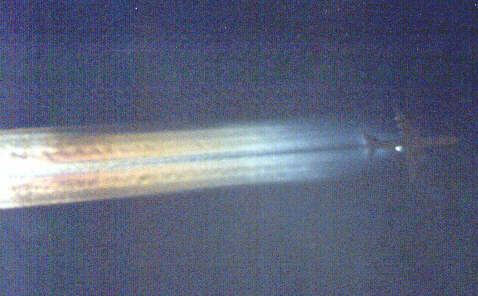 This set of photos shows aerosol emissions extending across the entire wingspan of a McDonnell Douglas MD80 aircraft on November 30, 1999 in Santa Fe, New Mexico . 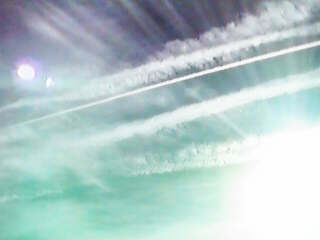 This aircraft has rear mounted engines, showing that this wide span of aerosols cannot be emanating from the engines alone. These pictures show the same entire wingspan results that have been witnessed in previous Carnicom papers named THIRD ‘MEGASPRAYER’ CAPTURED (September 9, 1999), NEW CHEMTRAIL SPRAY SYSTEM REVEALED (August 14, 1999), and NEW CHEMTRAIL SPRAY SYSTEM CONFIRMED (August 14, 1999). University of Michigan Correspondence with Individual Seeking Information on Nano Technology Research Program: TIME LINE OVERVIEW: 1. Letter to Dr. Jones - DARPA - Nov. 15th from A. C. Griffith. 2. Reply from the Director of DARPA, Lawrence H. Dubois, Nov. 16th to A.C. Griffith. 3. A.C.Griffith made one telephone call and one e-mail to Univ. of Mich., News and Information Service, Ann Arbor, Michigan, Nov. 17th. 4. E-mail to A.C. Griffith received from Officer Sura on computer in Winston-Salem. 5. Telephone message to A.C. Griffith on answering machine in Richmond from Officer Sura, University of Michigan, sometime between Nov. 19 and Nov. 21, 1999. 6. 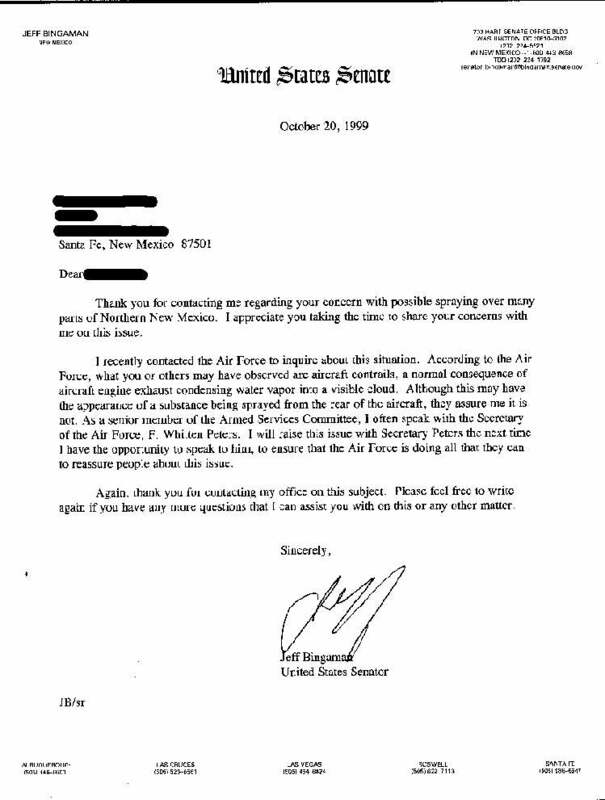 Reply letter to Officer Sura dated Nov. 22, 1999. 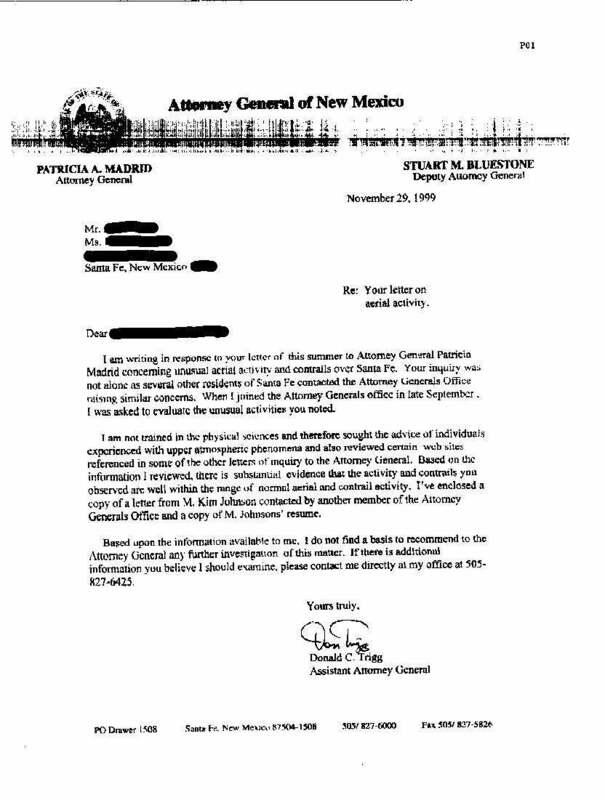 In this paper, pictures captured and posted by Clifford Carnicom in the southern sky of Santa Fe, New Mexico on November 20, 1999, show massive trails sprayed in various patterns at different altitudes and spreading out into persistent trails. 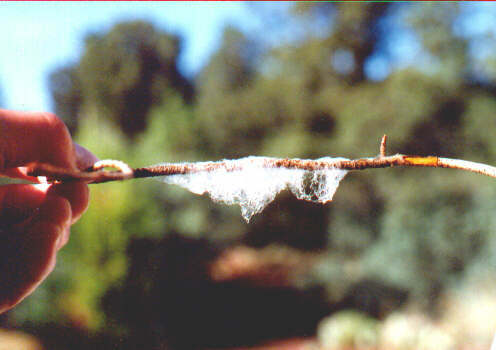 Photographs depicting clumps of fibrous looking material scattered on the ground are presented in this paper, and were taken by a witness in Sedona, Arizona on July 10, 1999. These samples were found on the ground after numerous townspeople reported hearing low flying aircraft the previous night. The samples, which reportedly made some people ill, had a petrochemical odor, and dissipated by mid-morning. 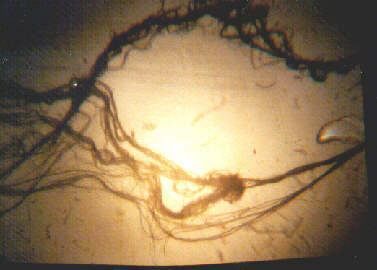 Microscopic views are presented of two filaments taken from a ground fiber sample after aerial spraying in eastern Oregon on November 2nd and November 4th, 1999. Observation and analysis indicate that the samples appear to be a polymer of some type, being both extremely elastic and adhesive, raising the possibility that this material may act as a carrier mechanism. The materials are white, and look like spider webs. The materials, under magnification, show individual strands that are wave-like in nature, and tend to coalesce and congeal easily. Ill health effects have been reported in association with the handling of this material. This material is reported to dissipate within a few hours of falling on the ground, and in being exposed to the weather. 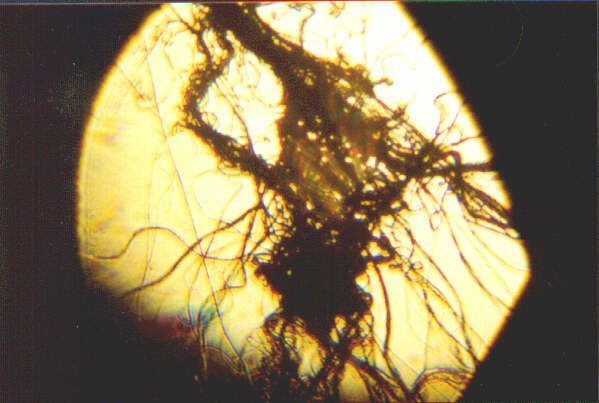 The ground fiber sample images are compared to and found not to be spider webs, and to be fully synthetic. Common health effects associated with this spraying include severe respiratory problems, burning eyes, feeling tired, and some people coughing up blood. Eyewitness accounts of finding unusual fiber materials on the ground have been accumulated over the past year and more in direct connection with unusual aircraft activity. As might be expected, there are repeated, frequent and widespread accounts of respiratory distress and allergic reactions reported in association with such aircraft activity. 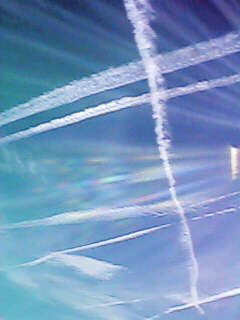 This paper continues previous research on and presents microscopic views of suspected chemtrail ground samples collected in November and December 1999. 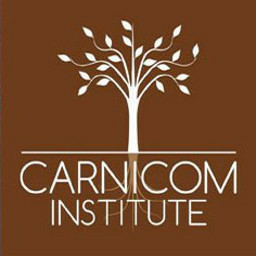 Two identical ground fiber samples (one from Sacramento, CA, and one from eastern Oregon) were received, analyzed and compared to synthetic and natural fibers, such as human hair, wool, silk, spider webs, cotton and more. Though found in locations hundreds of miles apart, these two ground fibers exhibited identical characteristics in all respects down to the microscopic level. Based on tests outlined in this paper, it has been demonstrated that the ground sample fibers cannot be identified as any known or common natural or synthetic fiber. POSTED: October 11, 1999 6:45am EST Christian Intelligence Advisory Exclusive http://www.tiac.net/users/tobya/ciaindex.html Aerosols, JFK, Jr. Activist Reports Extensive Harassment, Possible Attempt on Life by Andrew Amirault October 11, 1999 BOSTON, MA--Andrew Carbone, Jr., 35, of Middleboro, Massachusetts, claims he has been repeatedly and intensely harassed since beginning to seek answers from federal authorities regarding the "chemtrails" phenomenon, and after providing a videotape, related to the JFK. Jr. death, to a local TV station. Coalition to Protest Worldwide Aerial Spraying ("Aerosols"), 11.20.99 BOSTON, MA--A coalition including Will Thomas and other journalists, researchers and citizens will protest the aerial spraying, commonly called "chemtrails," over what appears to be all major populated areas of the United States, as well as parts of Europe and Australia. The demonstration will be held in front of the New York Times building, at 209 West 43rd St. on Saturday, November 20, 1999 from 12noon to 3pm, while simultaneous protests are being held in Santa Fe, NM and Aspen, CO. 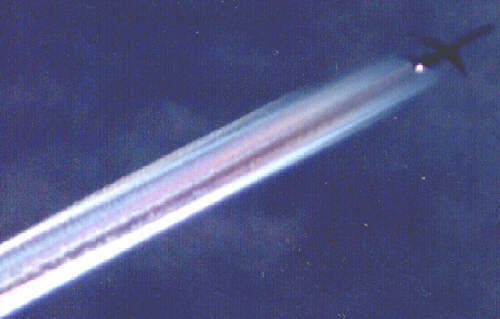 Yet a third telephoto set, this one from Santa Fe, New Mexico on September 9, 1999 depicts a full length wing spray system. This plane appears to be a Boeing 757, with the majority of aircraft during spraying conditions appear to be of the Boeing 757 class, but a revision will be warranted is additional information is provided or becomes available. 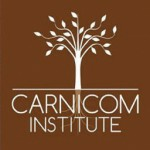 If anyone can identify this model of aircraft, it would be appreciated if you could contact the Carnicom Institute email at info@carnicominstitute.org with any such helpful identifying information.